The West Virginia Southern District is upgrading to NextGen CM/ECF on June 11, 2018, so to e-file after that date in the WVSD you will need an upgraded PACER account. We share PACER accounts in my firm/office. Can we continue to do this after June 11, 2018 when the WVSD upgrades to NextGen CM/ECF? If you intend to e-file in the WVSD after June 11, 2018, you will be required to have your own PACER account because your PACER account will be linked to your e-filing account. You must upgrade your PACER account before the WVSD converts to NextGen CM/ECF on June 11, 2018. You should wait for the WVSD to convert to NextGen CM/ECF on June 11, 2018 before you proceed. NOTE: Once the WVSD converts to NextGen, you will link your filing credentials (login and password) to your upgraded PACER account. You must know both sets of credentials to link the accounts. You should not rely on the browser to remember these credentials. To recover an old e-filer password from the WVSD, you must contact the WVSD CM/ECF Help Desk at (304)-347-3111. NOTE: When you reset your password, you must enter the email address that is on file at the PACER for the process to be successful. When will the WVSD convert to NextGen CM/ECF? The WVSD will convert to NextGen CM/ECF on Monday, June 11, 2018. How do I know if a court has converted to NextGen CM/ECF? Check the CM/ECF links page. The page will show the word "NextGen" next to any court that has converted to NextGen CM/ECF. IT IS AFTER JUNE 11, 2018 AND THE WVSD HAS ALREADY CONVERTED TO NEXTGEN CM/ECF. WHAT DO I DO? I am an e-filer and WVSD converted to NextGen CM/ECF. What do I do now? See the section of questions above to determine if you have an upgraded PACER account, and for links to upgrade if you have not done so already. Follow the instructions below to link your e-filing and PACER accounts. 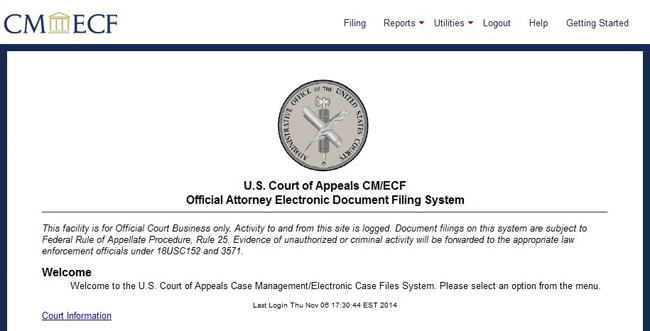 Open your browser and go to the CM/ECF website of the court where you are registered. If you do not have the web address, you can link to it from here. If successful, your CM/ECF e-filing account will now be linked to your upgraded PACER account and you will see the following screen. 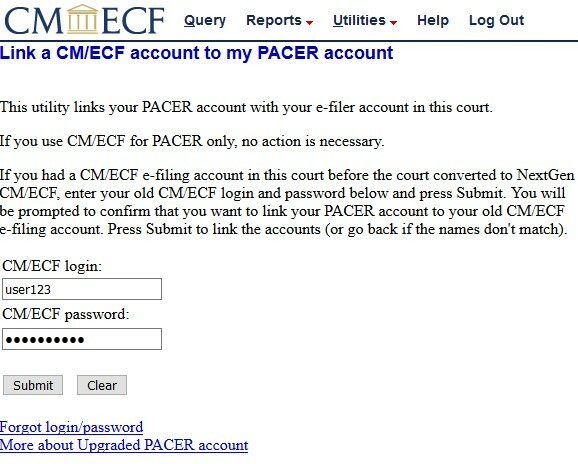 From this point forward, use your upgraded PACER account credentials to log in to file and/or view case information in any NextGen CM/ECF court. Click either Attorney Admissions/E-File Registration or Non-Attorney Admissions E-File Registration. I never had e-filing privileges in the WVSD, but I need them now. What do I do? You will then need to wait for the WVSD to process the request before e-filing privileges are activated. My firm had one account, and now we have many. Can we combine the billing? 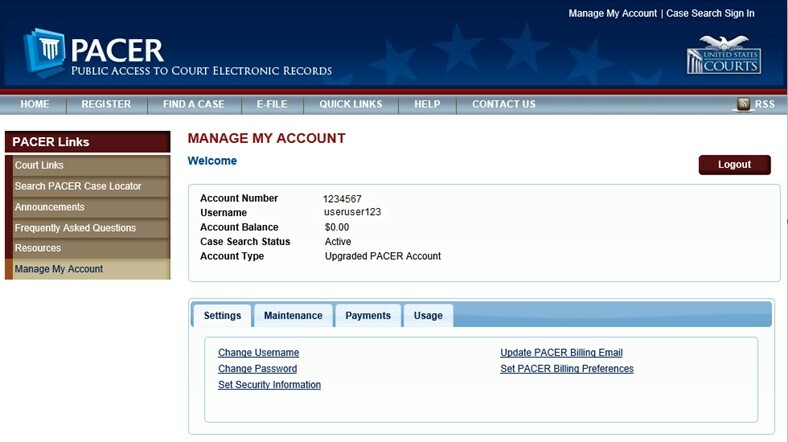 If you have two PACER accounts, contact the PACER Service Center at (800)-676-6856 for additional information.